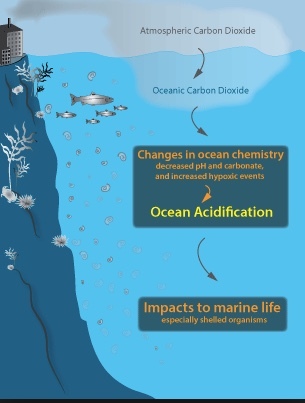 The US National Oceanic and Atmospheric Administration (NOAA) defines the term as “the chemical changes in the ocean as a result of carbon dioxide emissions.” While that seems simple enough a definition, there are a lot of complications. First, the ocean covers about 71% of the Earth’s surface and hold about 96% of the Earth’s water, much of which is salty. So what happens to our ocean is critical for us. Second, carbon dioxide emissions into the atmosphere continue to increase, largely because of the burning of fossil fuels, deforestation, and other human activities. About a quarter of this CO2 is absorbed by the ocean. While that has been beneficial in reducing the levels of CO2 in the air, it also has led to a rise in the CO2 in the ocean resulting in an increase in acid in the ocean (or lowering ph levels). That change is creating serious effects on the chemistry of the ocean’s water and on the ocean’s ecosystem. The more acid in the ocean, the less calcium carbonate minerals are available for building of shells and skeletons necessary for much sea life, such as reef-building corals, mussels and plankton. Over a billion people rely on food from the ocean as a source of protein, and many rely on fishing resources for their livelihood. Further acidification of the ocean will threaten all those interests. Identify all the food you eat that comes from the ocean. Determine what portion of your diet comes from food from the ocean. Figure out what percentage of your daily protein comes from food from the ocean, and what foods you could eat to replace this protein if the seafood was not available to you.